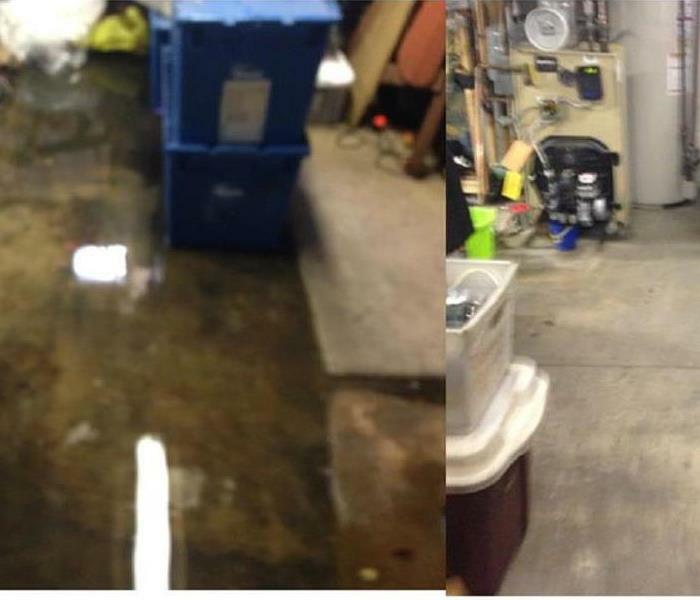 SERVPRO of Mount Ephraim/ Bellmawr are experts in water damage restoration. SERVPRO has been certified by IICRC in applied structural damage. In the picture you can say a technique called tenting which is forcing hot air from a dehumidifier to dry this subfloor. SERVPRO is using this technique to dry an area in a effective and timely way. Readings are an important part of the drying process after a water loss. SERVPRO of Mount Ephraim/ Bellmawr wants to make sure that the property is drying. If the property is not drying then SERVPRO will do all measures to make sure that it dries. This home in Woolwich, New Jersey had a pipe break in between the first and second floor of this town home. Luckily they called SERVPRO of Mount Ephraim/ Bellmawr who showed up to the loss on a Sunday night. The homeowner was very happy about getting their home back to normal. SERVPRO is a 24/7 business and are here to help all customers. 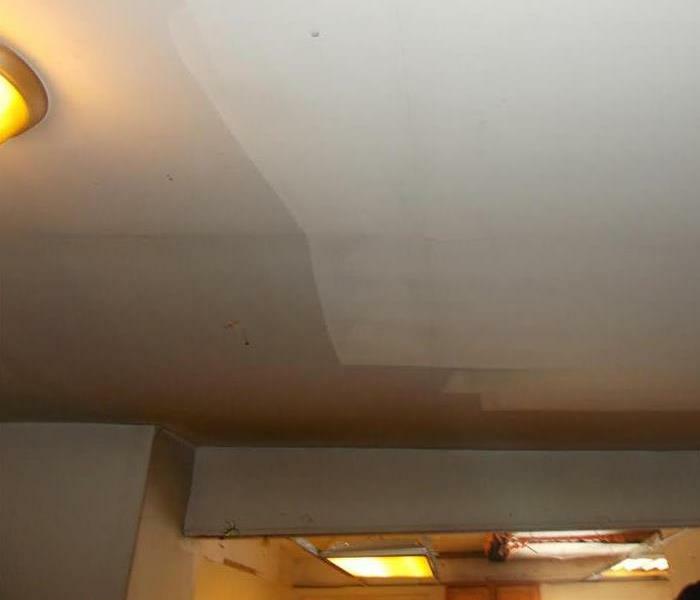 This home in Barrington, New Jersey had a hot water heater leak that spread inbetween the walls. If water is able to sit inbetween walls for a couple of days, mold growth will start to grow thoughout the home. The homeowner was able to notice the water and called SERVPRO of Mount Ephraim/ Bellmawr. SERVPRO was able to take out the walls and dry the stucture. 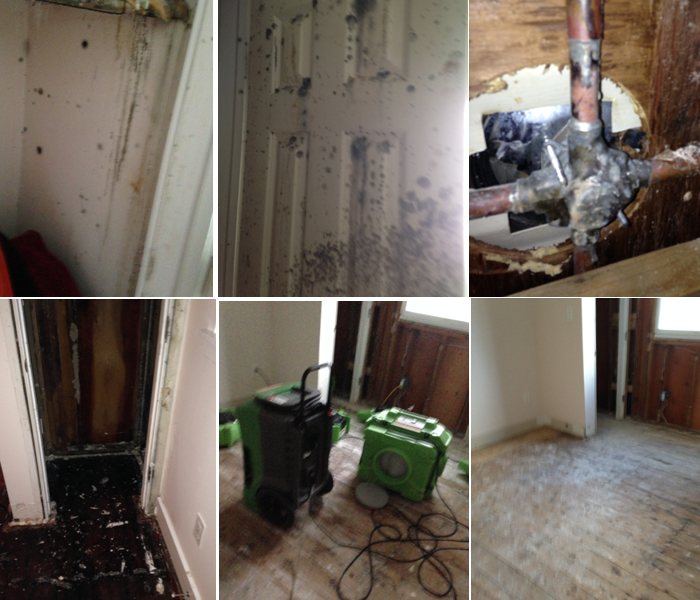 In this Bellmawr New Jersey home a hot water heater leaked impacting kitchen and laundry room walls. The water also effected the crawlspace under the house. 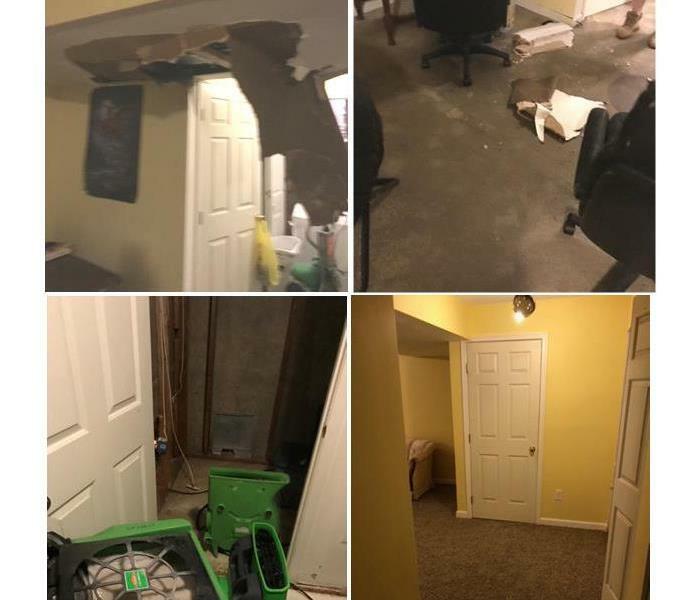 SERVPRO of Mount Ephraim/ Bellmawr was able to dry some of the affected area but some of the walls had to be cut because they were saturated. The home owner was exicted about the rebuild on their home. They were so happy to see their new kitchen and laundry room. SERVPRO "Like it never even happened." Assisting this customer with their desire for an end to end solution allowing them one contact through this process was a pleasure. The broken pipe in ceiling caused damage throughout the basement and it was our pleasure to make it "Like it never even happened". We assisted a customer who was looking for an end to end solution following a broken pipe in the ceiling of their finished basement. We were able to complete the emergency service as well as provide re-construction services allowing them to have one point of contact throughout the job. For all your restoration needs call us at 856-349-7318. Always here to help. 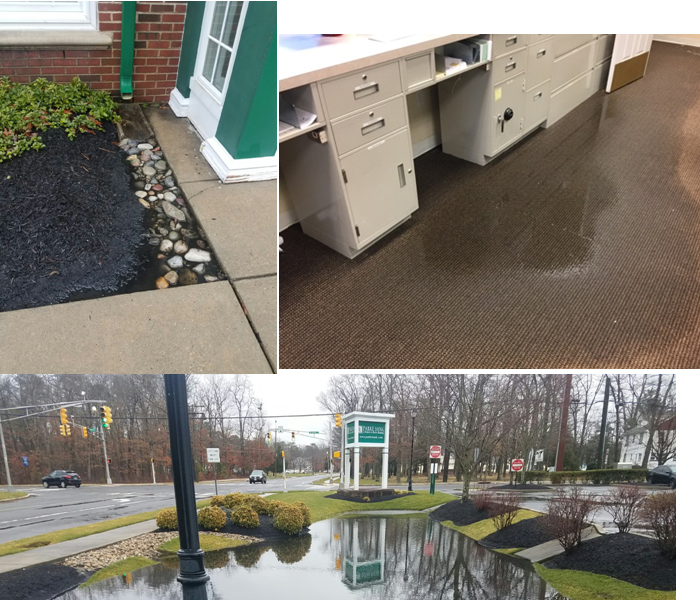 At this Penn Medicine in Woodbury, New Jersey a pipe broke after a couple of cold days and spread water throughout their waiting room. They were thankful that SERVPRO showed up at night to help extract water and get them open for business the next morning. For all your commercial needs call SERVPRO of Mount Ephraim/ Bellmawr at 856-349-7318. 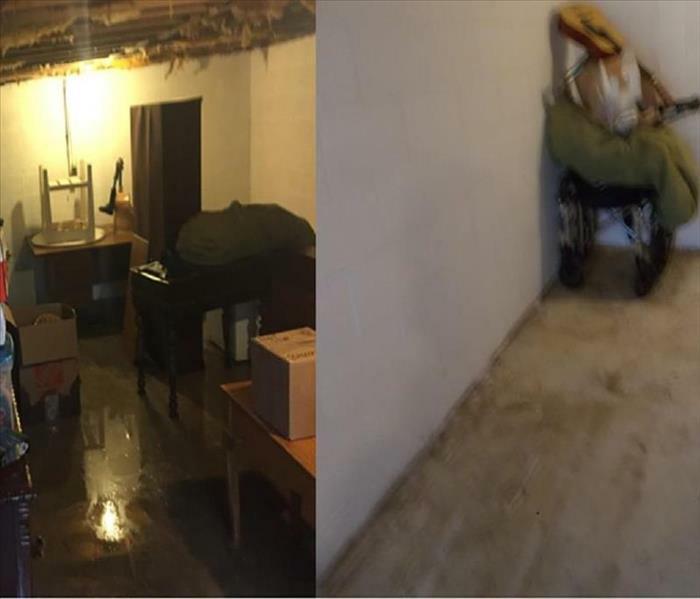 In this Haddon Heights home after a snow storm came the water table rose and the basement flooded they were happy when SERVPRO of Mount Ephraim/ Bellmawr showed up and extracted water from their basement and were able to dry their basement in a couple days. For all your water damage needs call SERVPRO at 856-349-7318. 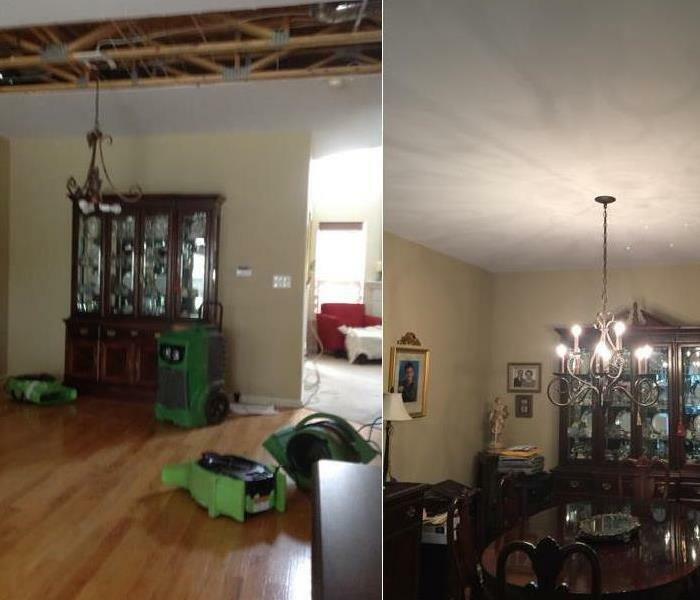 This Bellmawr NJ home sustained water damage due to a pipe burst while they were away. We arrived on site shortly after the call and got the customer extracted and dried quickly. Sometimes a picture captures the moment better than words. Time to pick up the equipment and help the customer build back. Should you have a water problem with your tri-state area home call us to assist. A home owner was in the process of getting some home decorating completed. The painter identified an ongoing challenge with the fireplace that caused a light film of soot and smoke to cover the home. The homeowner called us to evaluate and ultimately complete soot restoration. This was done in order for the paint to adhere to the walls and coloring to be proper. In this case the home owner was fortunate to catch this problem with fireplace before a greater disaster could have occurred. The home is clean and painted now with a happy customer. This was the aftermath of heavy rains causing flooding in a basement in West Depford NJ when we arrived on the scene. The owner couldn't believe how quickly and completely we were able to pump out the water and begin the drying process. We make disasters "Like it never even happened." This was the aftermath caused by a fire originating in an attached garage. As with all fires the burning content and structural material emit smoke and other toxins into the air. In the case of garages combustible and toxic materials exist that can cause harm to other areas of the home where smoke has traveled. 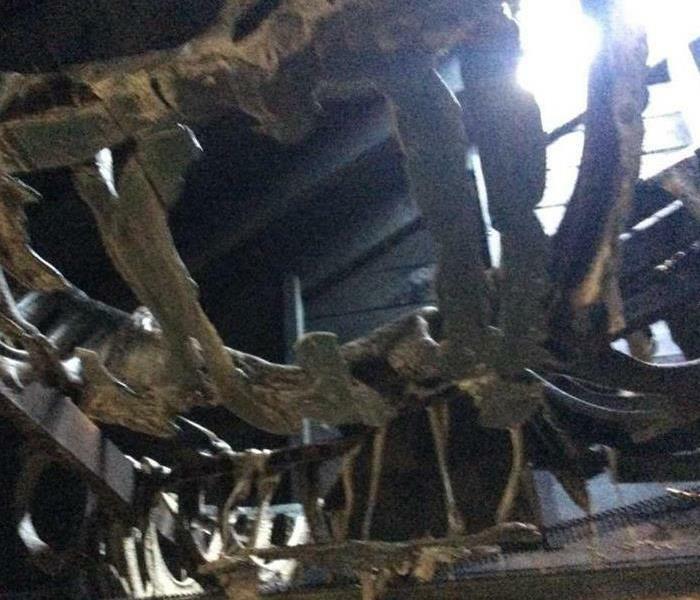 Pictured is a plastic pool chair that was exposed to heat and flame. The owner couldn't believe how quickly and completely we were able to clean the soot from the walls and ceiling. We make disasters "Like it never even happened." A fast moving wind and rain storm caused water damage in the office next to SERVPRO Mount Ephraim Bellmawr. The landlord contacted us immediately as we already had a key to that space to work on minimizing damage. The water came from top down in an empty facility next to our office and we were able to stop it from impacting surrounding offices. This home was impacted by heavy rain and winds that came through our area. The wind caused the rain to push back through the shingles due to the type of gutters that were on the home. This caused water damage on multiple levels of the home. Time to action was critical as the home owner was preparing to sell and wanted to minimize any further damage. This Brooklawn NJ home sustained significant damage when home owner was away. The secondary loss due to mold growth is extensive. This is not a stock photo or one used in class rooms to teach about remediation. This is a current project we are working on and has a multitude of challenges. We are working to make it "Like it never even happened." This was the aftermath of a broken pipe which caused the HVAC to turn off and allow water into a home in Brooklawn NJ. We are currently in process working with insurance carrier and home owner to re-mediate fully. When water is introduced into an unconditioned environment mold can bloom rapidly. 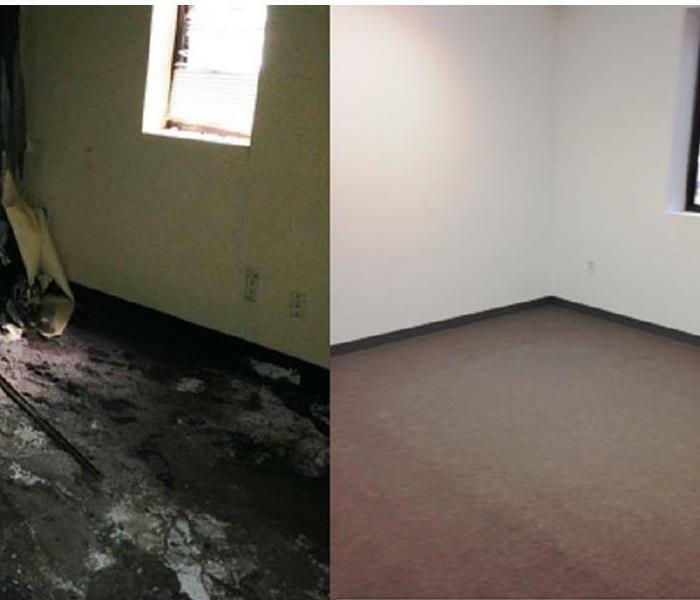 This is a before image of a water loss in an office in Philadelphia PA. The HVAC leaked and spread throughout the office space soaking the carpet and some content within the office. The office manager was concerned about the ability to remain functional while remediation was under way. We worked with her to achieve both goals. An Office in Camden NJ had a challenge with their HVAC unit during a period when the facility was not in use. With the rapid blooming of suspected mold it was evident that spores previously existed. We need to work quickly to reduce relative humidity in structure while the HVAC unit was repaired and contain the structure. The owner couldn't believe how quickly we were able to get the situation under control and re-mediate the mold. We make disasters "Like it never even happened." A garage fire caused significant structural and smoke damage to a home in Mount Ephraim NJ. We received the call arrived on site worked with the customers insurance company to get the claim in order. While the garage had significant fire damage the rest of the home sustained smoke and soot damage necessitating cleaning/deodorizing of all surfaces and content. 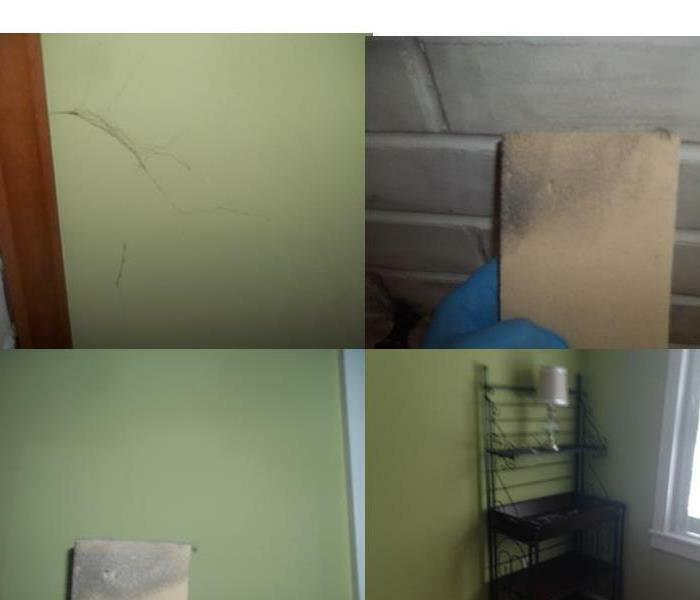 Please visit our site to learn more about fire and smoke damage restoration process. Smoke and fire damage can be a challenge to your air ducts. Even after cleaning the structure and contents air ducts can trap odor. There was significant smoke and soot damage. The owner couldn't believe how quickly and completely we were able to clean the soot from the structure including the air ductswalls. We make disasters "Like it never even happened." Smoke and fire damage can get into places you would never believe from the easy to reach like the walls, ceilings, and floors to harder to reach places like rafters, attics, basements, and many more. The odors from fire and smoke can stay trapped in a house until it gets cleaned by professionals like SERVPRO of Mt. Ephraim/ Bellmawr. SERVPRO of Mt. Ephraim/ Bellmawr make disasters "Like it never even happened." The owner didn't realize the difference between a clean ceiling and a ceiling with soot until he saw this. The owner couldn't believe how quickly and completely we were able to clean the soot from the walls and ceiling. We make disasters "Like it never even happened." 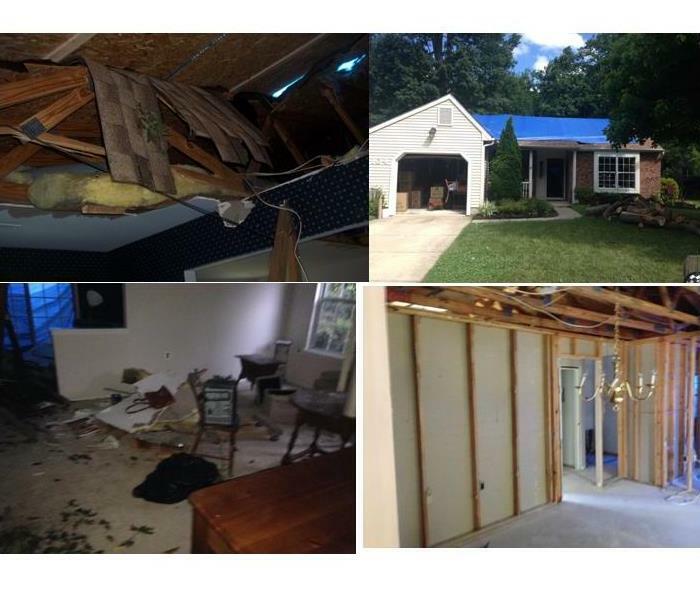 We received a call from a concerned customer regarding storm damage to her Washington Twp. Her concern was water damage caused by a limb going through her roof and discovery of some mold. We responded worked with her insurance company to review and cover claim and had dried out in no time. We make disasters "Like it never even happened." This was the aftermath of storm damage to a roof in Pennsauken NJ. When the new roof was being put on the aged slate dust covered the entire church. The Church was concerned with getting back to operational for services. We were on the scene and began work. 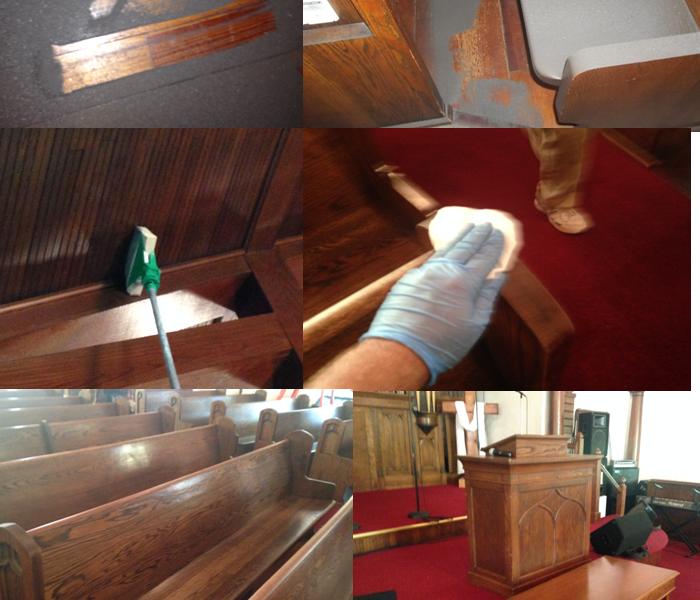 The owner couldn't believe how quickly and completely we were able to clean the dust/debris from all surfaces. We make disasters "Like it never even happened." One of our customers called regarding water entering a branch office after a storm. We had an Emergency Ready Plan (ERP) in place and knew where to go and what was approved prior to arriving onsite. This allowed us to act quickly and minimize any damage to the facility. Water Fire Mold Bio Hazard Cleaning we will respond and we will get the job done "Like it never even happened." 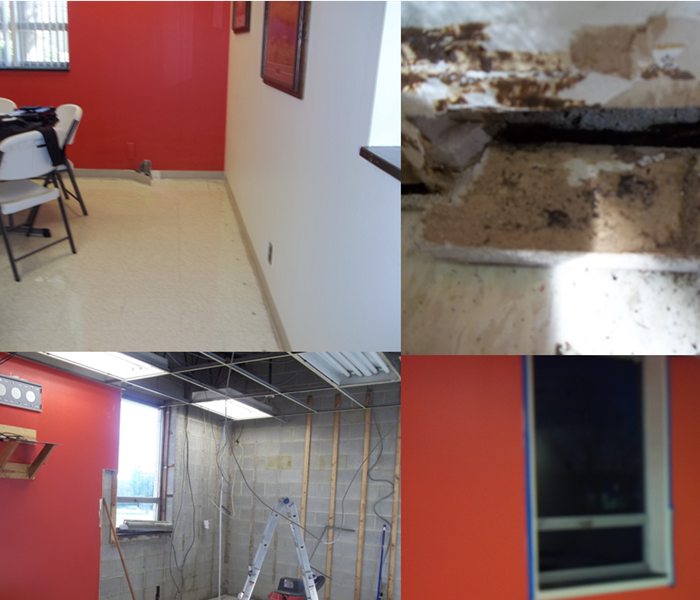 This was the aftermath of a foundation leak that ultimately caused mold in the lunch room. We were able to contain the area safely, dry the structure, treat the mold, and rebuild the facility. As this was their primary lunch room safety and time to completion were important factors. The owner couldn't believe how quickly and completely we were able to restore the facility. We make disasters "Like it never even happened." We received an early morning call from a facilities manager regarding a water leak in their warehouse. The main concern was stopping the water from impacting inventory and causing greater damage. We dispatched immediately and began the process. The owner couldn't believe how quickly and completely we were able to extract and dry the structure. We make disasters "Like it never even happened." This was the aftermath of a frozen pipe in an unoccupied office. 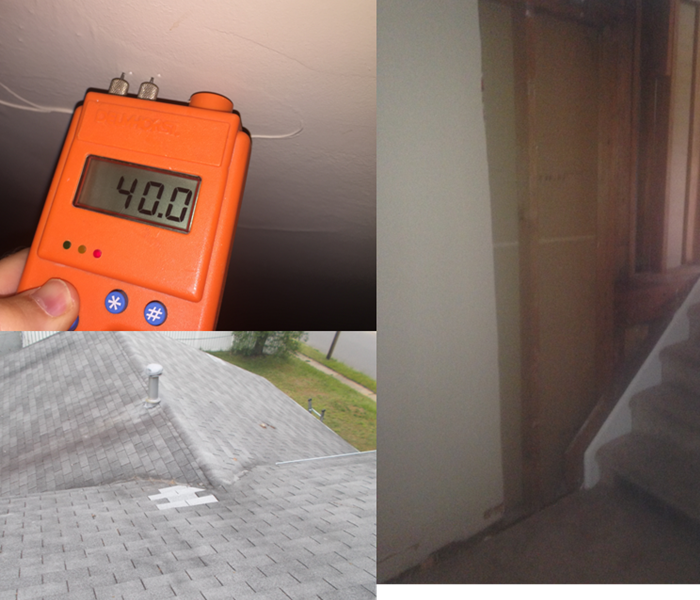 We were able to minimize further loss take care of the mold caused by water damage and complete the build-back. 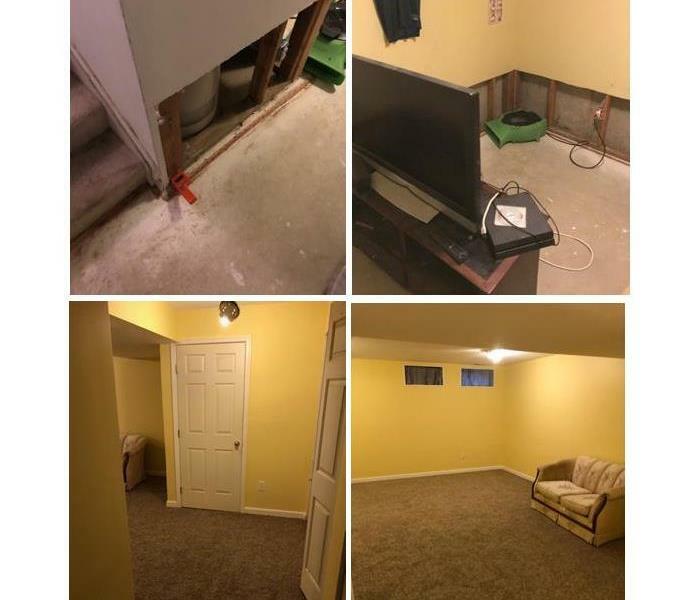 This allowed the landlord to list the property again for sale. The owner couldn't believe how quickly and completely we were able to restore the property. We make disasters "Like it never even happened." 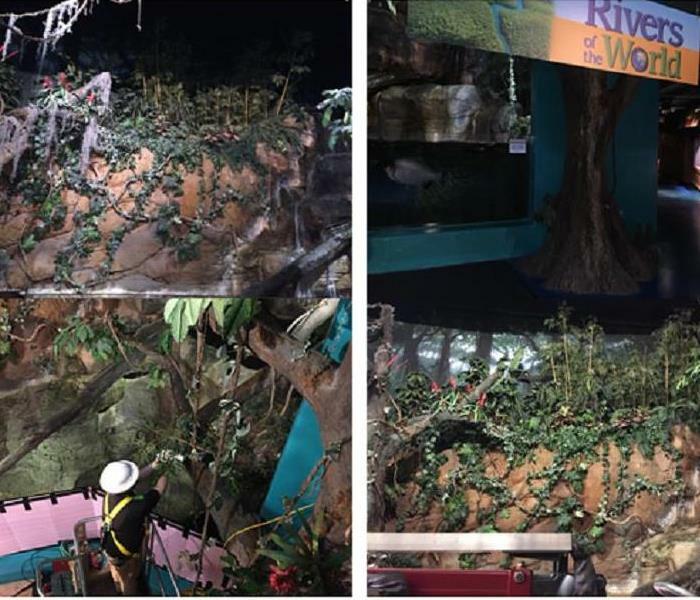 Our office received an interesting non emergency call from Adventure Aquarium in Camden asking if we cleaned artificial foliage that had an excess of dust and dirt build up. We met with them understood their needs parameters of scope and budget. We provided a solution based bid including process and products to be used and approved by their staff for safety. 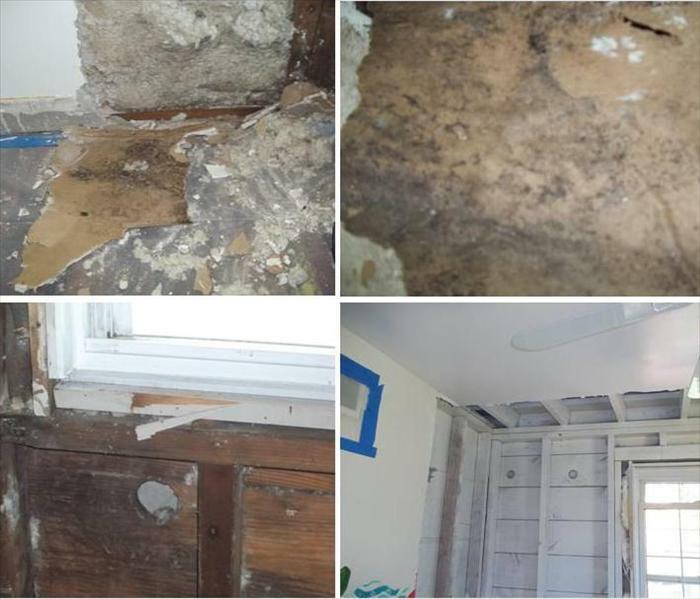 This home in Pennsauken NJ sustained water damage during a heavy rain due to a sump pump failure. We were able to arrive on site quickly extract the water and get the drying process started. While doing this we worked with the home owner to salvage his tools and wood working equipment. The home owner was appreciative and could not believe how quickly the job was completed. This was the aftermath of a toilet overflow in Lumberton NJ when we arrived on the scene. There was significant water damage to dining room area and upper hall bath. The owner couldn't believe how quickly and completely we were able to stabilize the home dry it out and get the drywall replaced and painted. We make disasters "Like it never even happened." Heavy rains and a sump failure caused water to back up into this home owners basement. We were able to arrive on site stabilize the location and begin saving some of the stored items that had emotional significance to them. From beginning to end we were able to complete the job in 4 days and restore some items back in our warehouse where drying would be more successful. We make even smaller disasters "Like it never even happened." A wind and rain storm blew through the area toppling a large tree onto a house. Thankfully no one was injured and we were able to secure the property move salvageable belongings to storage and prepare house for structural repairs. The owners couldn't believe how quickly we were able to restore the loss site and help them transition to temporary housing. We make disasters "Like it never even happened." A musty smell in a young child’s room prompted a call to us. There were no visible signs of mold other than a small paint bubble under the window, however, we took precautions immediately. After further examination/investigation, mold was found under the window and in fact it affected the entire back wall of the child's room. Unseen mold can be dangerous because it can cultivate extensively without being detected by naked eyes. 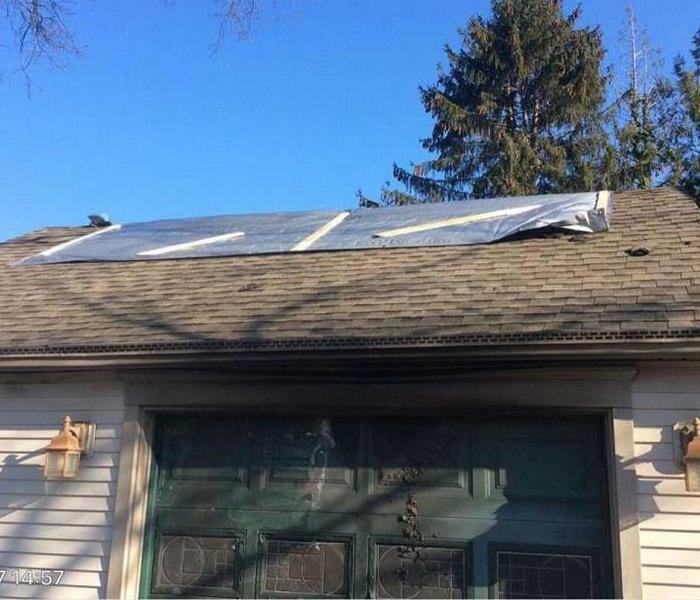 One of the sources of water was the roof that was damaged during a wind storm and was leaking into the attic as well as the child's room. 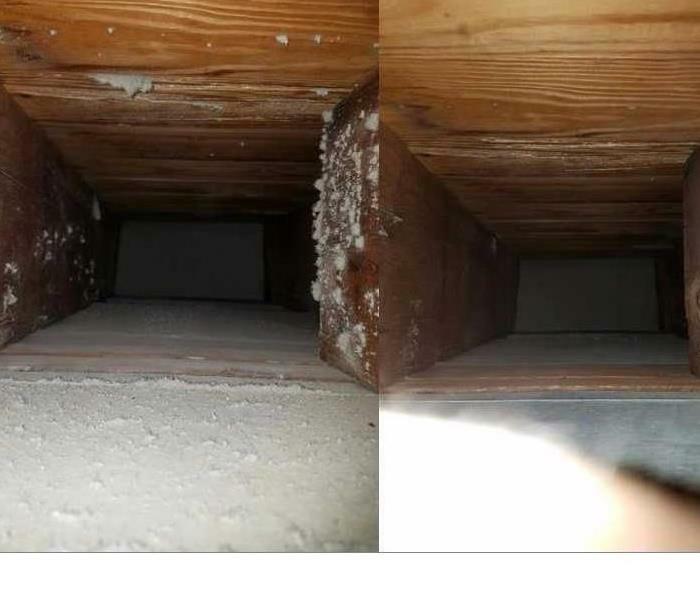 The entire attic was also contaminated with mold and needed to be remediated. 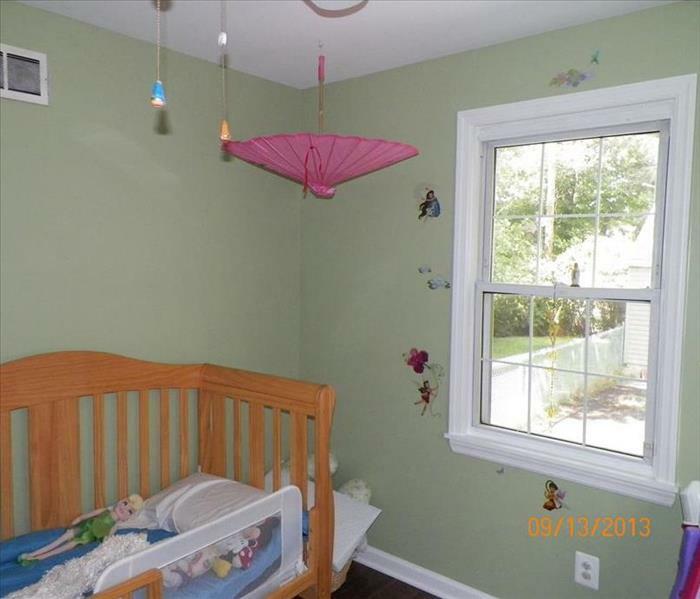 A week later a little girl’s room was returned to her safe and sound... "even with Fairies dancing on the walls". Often times when someone is remodeling they are excited and prepared for the challenges. However, when disaster strikes we are not prepared nor excited about the inconvenience. We try to encourage our customers while not planned to use it as an opportunity to make the changes they may have been thinking about. This was a situation where the home owner happened to go to his shore house in the winter. When he walked into the home he noticed a musty smell. A small pipe break can cause big damage if unattended. 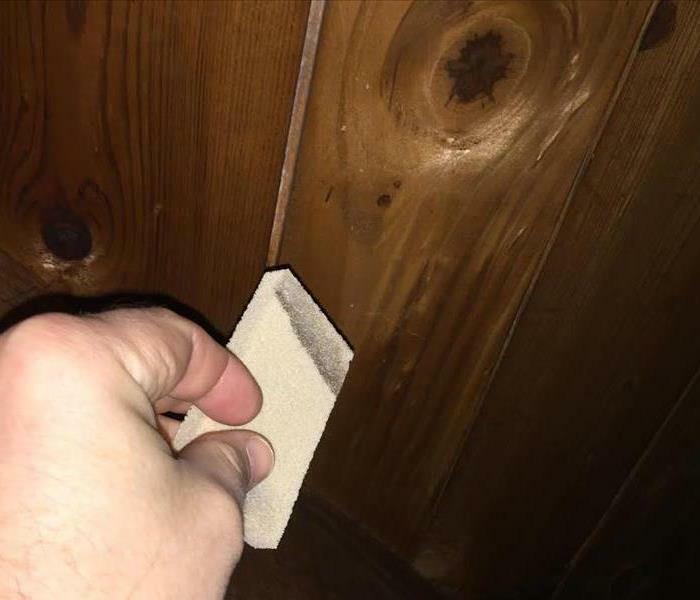 He was fortunate that he caught it when he did and was able to contain the loss to one room in the home as well as some work in the crawl space.